I was gladly able to go through my GoPro photos and video, and see what I got. Well, obviously I got the above photo. I wasn’t that close to the performer, Madeleine Belle, and had to lift that tiny camera way above my head, and since I’m pretty short, that wasn’t very high, either. 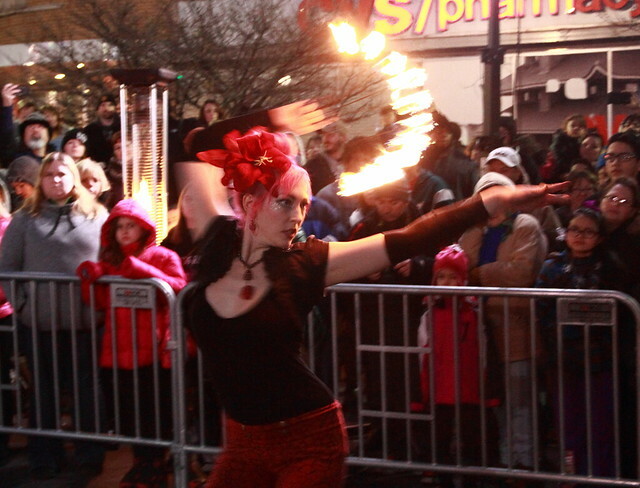 Still, here’s a few more shots of fire performance. I know, they are blurry, but with motion blur and how fast she was moving, I think they are pretty cool! Oh, not leave out the video part, but here’s a short one that I took of the ice slide at the fest. I was at the First Annual Reading Fire + Ice Fest last year. It was frickin’ cold, and there was neat things to see and good entertainment. I told myself that I was going to dress warmer and bring my camera for the next year. I got some excellent shots of both the fire, such as Philadelphia-based fire flow artist Madeleine Belle, featured above, and ice, such as the carver below. I had a really great time! I was there with Joan, and you can see her video of one of Madeleine Belle’s performances here. If you would like, I actually posted these photos over on Flickr, rather than Zenfolio. I will post them on Zenfolio soon, but I want to go through my GoPro shots and footage first. Stay tuned for that!